As our semester is creeping towards its close, we students are lucky if we find the opportunity to really let loose and enjoy a night of drinks, dancing, and impeccable fashion. A night one takes away from deadlines should be heavily rewarded and should live up to all expectations so as to keep us satisfied for another week's worth of essays. 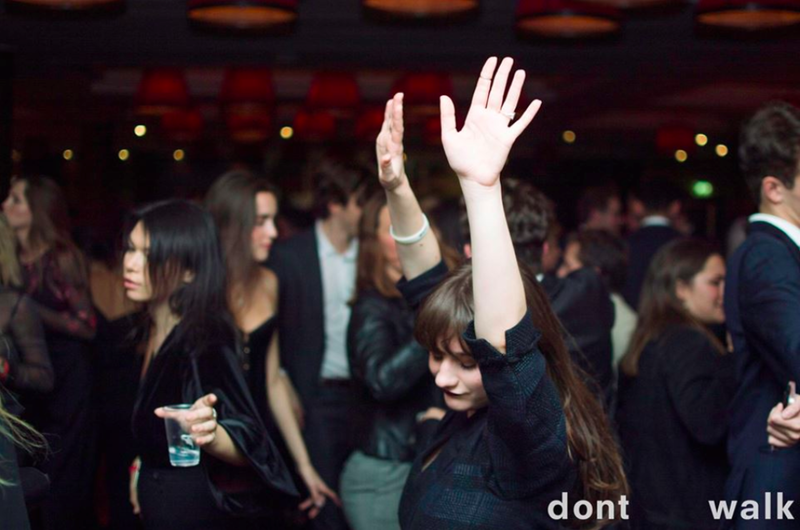 Fortunately for us, this is exactly what DONT WALK brought to the table with their DONT WALK launch party. Since we are only now starting to finish up this first semester, we haven't yet been thrust into the impressive, thrilling and somewhat mad environment that overtakes St Andrews during fashion show season (which falls in the beginning of second semester). Though some may be well-versed in this exhilarating time of the year, many freshers have no idea what to expect. By attending DONT WALK's launch party, I was all able to catch a much-awaited glimpse into DON’T WALK's highly anticipated show. Even if you have attended the fashion show before or have heard loads about it, DONT WALK seems to be promising something this year through the launch party, something that is innovative, creative, and captivating. The first thing I noticed when I walked into the event was, obviously, the venue. 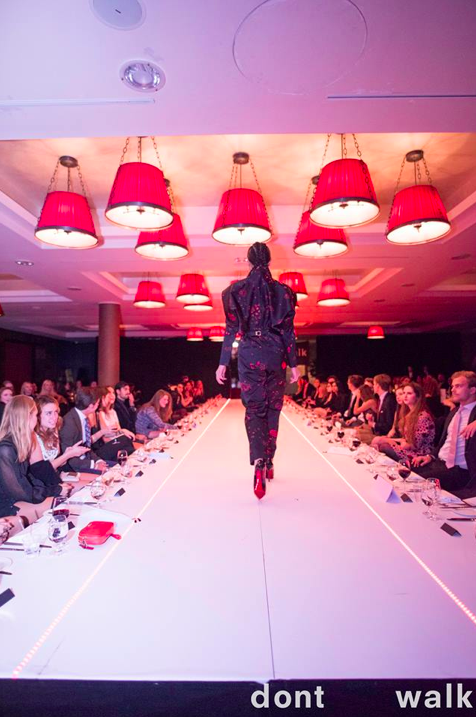 The Old Course fit the event perfectly, as it offered a beautiful historic backdrop to the contemporary fashion choices and decor for the party, with red neon lights lining the runway, floor and walls of the room. The abundance of red shades that were set up throughout the room gave the event a certain ambiance of old but exciting times, echoing the energy which built up during the tense and captivating beginning of the choreography. Seeing both the groundbreaking outfits modelled and the modern choices made by the attendees against this environment really accentuated every sparkle and every pattern of the chosen clothing. One thing in particular that completely fascinated me was the level of detail imbued in every model's look. Black lipstick, slicked-back hair, and structured but voluminous articles of clothing all merged together, perfectly screaming contemporary chic. I usually don't think about the process of flawlessly coordinating hair and makeup to the outfit to achieve a certain image, but DONT WALK helped me finally see how it added to the look. I also loved the patterns chosen for the outfits since they had decided to both mix opposing fabrics and colours or match them for certain ensembles. There had been lots of deep greens, bold reds, and pure blacks spotted throughout the night from both models and attendees alike, so we will be looking out for these in the upcoming show. After finishing off the fashion show and dinner, the guests were invited for more drinks and, most importantly, lots of dancing. With bpm music collective's beats and a huge dancefloor people were dancing, mingling or filling up on their drinks, leaving every seat in the room empty. DONT WALK's music and atmosphere did a fabulous job in providing entertainment whilst enticing us to come for more in the fashion show later on this year. Following a night out at this point in the semester, we usually question if we should have stayed in, had a glass of wine, and watched a sappy romcom, or maybe even stayed in the library. In this case, DONT WALK's launch party offered a night of unlimited fun and refreshing fashion, which could definitely be seen by the hordes of people staying until the bitter end of the night. DONT WALK, you have lived up to your impeccable standards, and we can't wait to see what you bring us next!